Published: Nov. 22, 2018 at 09:47 p.m.
New Orleans Saints Alex Anzalone forces a fumble on Atlanta Falcons wide receiver Julio Jones and the Saints recover. 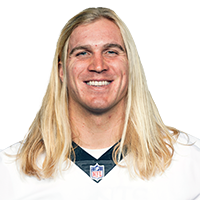 Published: Nov. 4, 2018 at 05:54 p.m.
New Orleans Saints linebacker Alex Anzalone lunges and intercepts Los Angeles Rams quarterback Jared Goff's pass. Published: Oct. 28, 2018 at 09:48 p.m. Published: Aug. 30, 2018 at 08:33 p.m.
New Orleans Saints linebacker Alex Anzalone intercepts the Los Angeles Rams as they drive to the end zone during preseason Week 4.